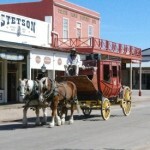 Take a guided tour of Tombstone in a stage coach and learn about the history of the town. Down By The River B and B nearby Tombstone is the perfect choice for lodging when you attend the 65 th Annual Tombstone Vigilante Days event. The three day event has something for everyone and starts Friday August 9 and runs to Sunday August 11 between 10 AM to 4 PM daily. The Vigilante Days Event includes live entertainment throughout the day such as gun fights, mock hangings, no one is actually hung by accident like the grave stone says in Boot Hill, an1880 fashion show and the pretty saloon girls are wandering around looking for the perfect guy to buy them a drink. There are period children’s games available for activities for the younger set. The Tombstone Vigilantes will raffle off a .45 caliber long colt lever action rifle which is the 27th in a series. Saturday there is a chili cook-off that starts at 8 AM and the chili can be sampled at 1 PM. The samples are available until the concoctions run out. This will take place on Allen Street in the center of town. Sunday will feature the 27th Annual 10K race that is mapped out on the website. The cost of the race is $18 with a shirt and $8 without. There is also a 2 K race that costs $15 with the shirt and $5 without. The race starts at 6:30 AM with registration starting at 5:30 AM or you can preregister if you wish. 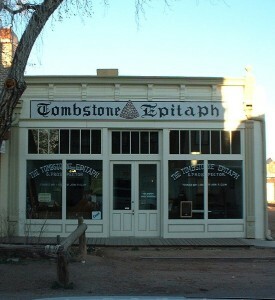 Visit the Tombstone Vigilantes Website for more information or call 520-457-3291. There are other lodging choices for a B and B nearby Tombstone, but we feel that our San Pedro River B and B, Down By The River, is actually a better place to stay. Being the Lodging Hub of Cochise County, our B and B nearby Tombstone is a short day trip from many attractions throughout Cochise and Eastern Santa Cruz Counties. After you have had your fun in Tombstone you visit other locations in the area or just sit on the patio and watch the monsoon storms that are should be in the area. This entry was posted 6 years ago on Wednesday, July 10th, 2013. and is filed under Events and Things To Do. 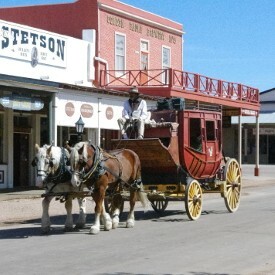 Reenactors walk the streets of Tombstone during the festivals and bring back the Old West feeling.